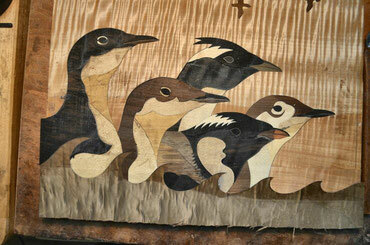 The Japanese Wood Inlay was developed in Odawara city. The works used to be exported to the foreign countries around 1820 through to 1935. 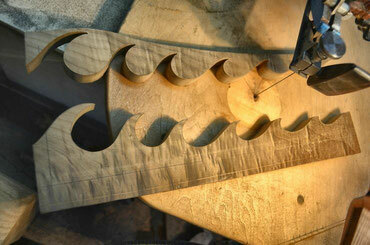 The Inlay 17mm thick is sliced into 80 to 100 very thin sheets with the plane called “Senn Plane”. Each piece of the wood to be inlayed is usually sawed by a scroll saw “obliquely”, but I do it totally “plumb”, that needs the highest technique. All the sliced works by me look almost the same picture by it. The thin sheets are pressed firmly onto the back board; they are hardly transformed by the change of humidity. 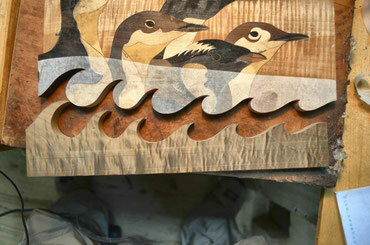 Using the natural wood only; my Wood Inlay keeps the color and they even get more deep colors with the years. 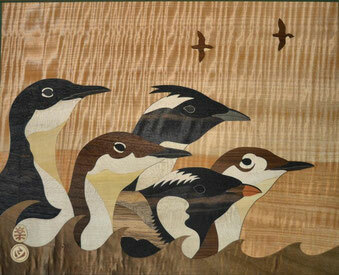 ③ Saw out the flying Murrelet just vertically. 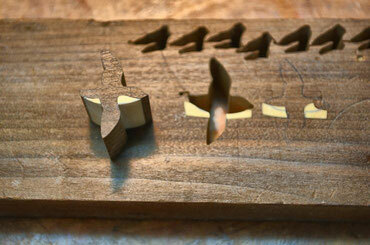 ⑤　Put some glue and inlay it. 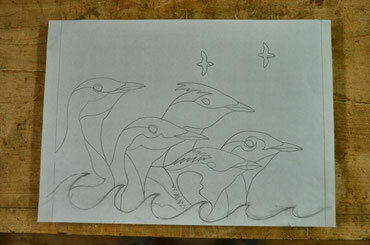 ⑦ Saw the base board, almost finished, along the shape of wave. Put the sawed wave into it. 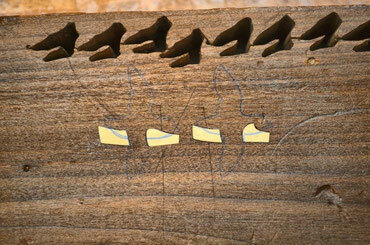 ⑨　Slice the completed wood inlay into 80 to 90 thin sheets with the Senn Plane. 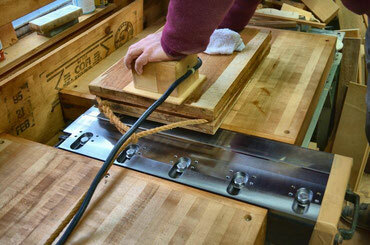 ⑪　Put some glue on the back boards and press firmly with the press. 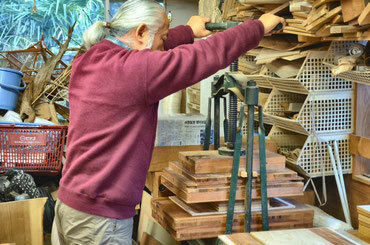 ② Inlay the Spindle Tree into the Petrified Katsura. 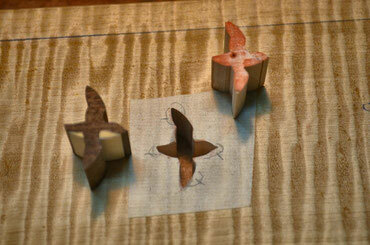 ④ Stamp the flying Murrelet on the Japanese paper.Glue temporarily to the base board and saw out vertically. ⑥ Saw out the wave pattern. ⑧ Put some glue and fix the wave firmly by clumps. 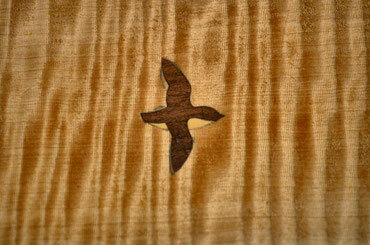 ⑩ The sliced inlay is called “zuku”. ⑫　Polish the surface with a sandpaper. 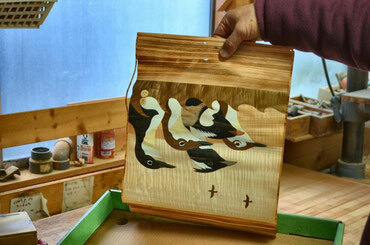 Put some lacquer on the surface to be completed. Copyright (c) Haruo Uchiyama. All rights reserved.